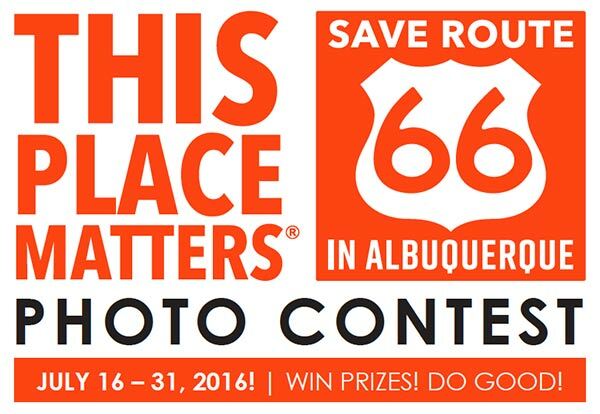 UPDATE: Announcing the WINNERS of the THIS PLACE MATTERS Photo Contest that was held JULY 16 – 31, 2016. Click here to visit the Photo Gallery! The National Trust for Historic Preservation’s THIS PLACE MATTERS campaign encourages people to celebrate the places that are meaningful to them and their communities. As part of this campaign, please join us in celebrating Historic Route 66 (Central Ave) in Albuquerque. Route 66 is a beloved symbol of America. Thousands of people from around the world visit Albuquerque each year to see one of the best preserved segments of this historic National Scenic Byway. Let’s do our best to preserve what’s left of this important piece of our history! All photos must focus on Route 66 (Central Avenue) between Unser and Louisiana. This includes buildings, vehicles, people, and places as well as the road itself. All photos must be taken while on a public way, not while on private property. All photos must be taken between July 16 – 31, 2016. Up to 6 digital photos were submitted by contestants. Click here to browse the Photo Gallery of all submissions and see who the winners are!. By submitting entries, each photographer agreed to grant the Members of Concerned Citizens’ to Make ART Smart the right to publish the photos on our website and in social media. All photos will be credited to the artist and the artist’s contact information will be provided as a way to facilitate the opportunity for artists to sell their work through the exposure they receive from this contest. The deadline for submitting photos was 8:00 pm on July 31st, 2016. PRIZES FROM LOCAL BUSINESSES ON ROUTE 66 WILL BE AWARDED!